Most of us understand how convenient it is to have a dedicated space where coats, hats and shoes can be dropped off. If your like me, you put a lot of thought into getting this one space perfect. (i.e. hooks for each person, easy to clean flooring, etc.) Generally, all these considerations are designed around children and/or pets. So, the one thing that you may have not incorporated into your plan is a keys and mail center. However, these home drop zone ideas can help you with that! 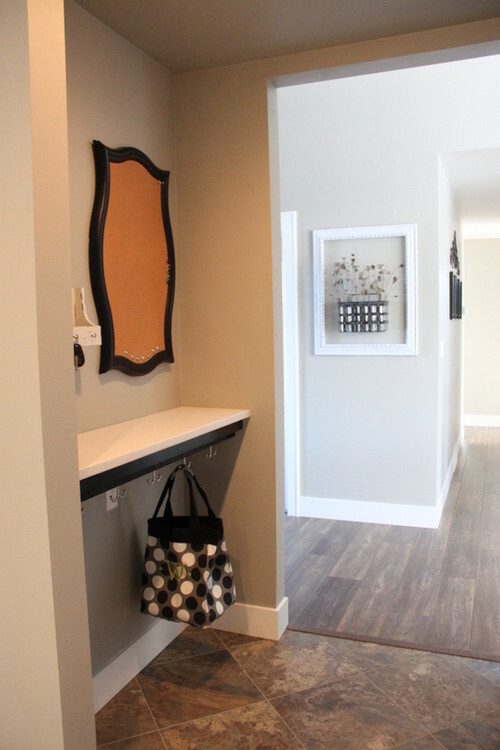 If you are low on space, but you want to have that mud bench, a combination drop zone may be the best idea. 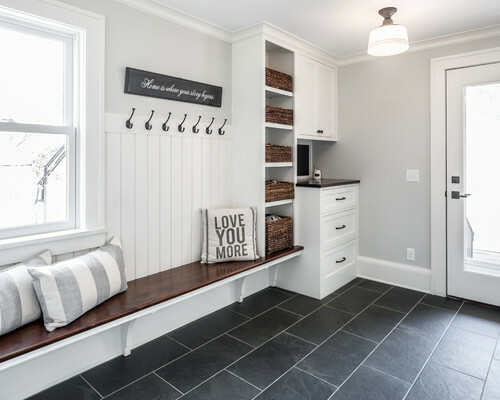 Instead of having one large mud bench, consider splitting the space to accommodate keys, mail, and phone charging devices. This drop zone (above) is one of my favorites. It has more than enough room for the mud bench to seat several comfortably. Plus, the desk area is created from a nice chest with a customized hutch. 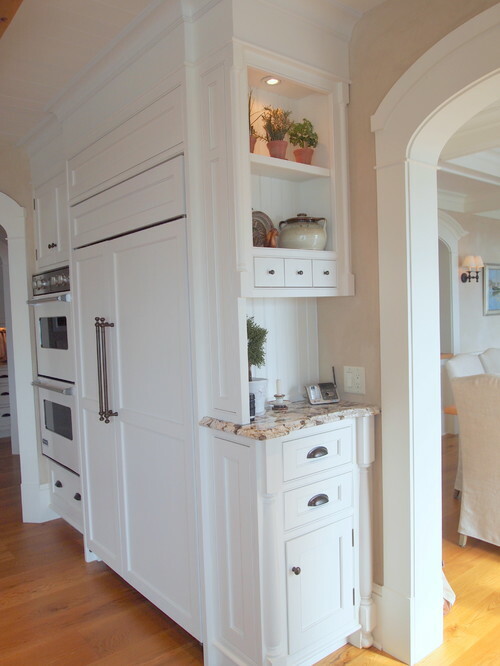 I also love the hutch doors that slide in and out of the way, but close up to hide the mess when needed. 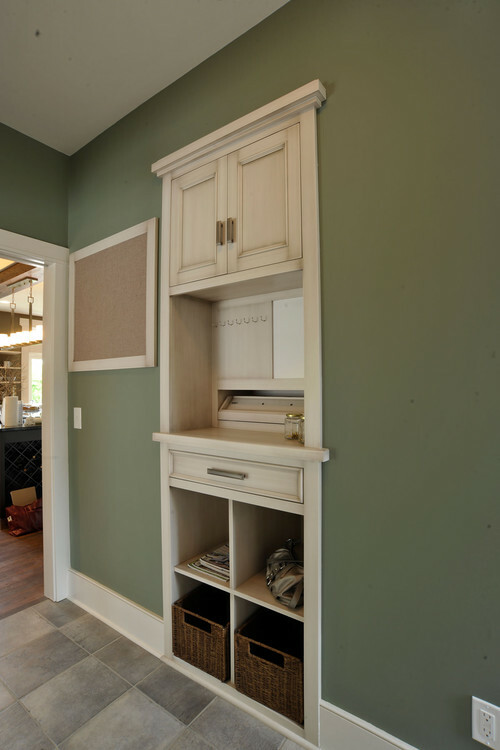 This drop zone has several small cubbies that would be perfect for a large family. (When planning out a drop zone with children in mind, remember that eventually they will get older and have keys and mail of there own. 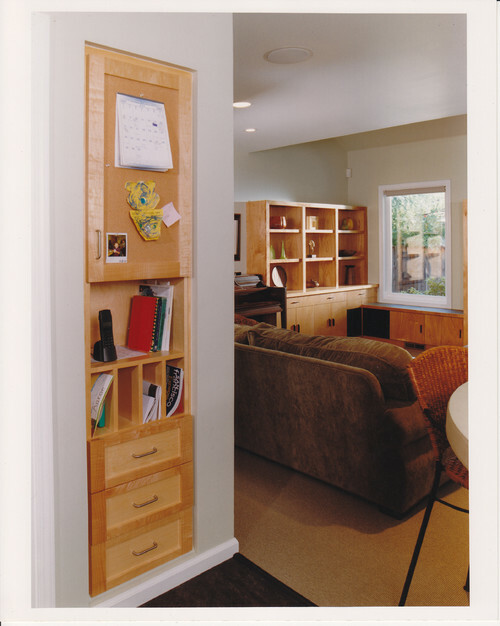 Individual cubbies are a nice way to sort each person’s mail and pocket devices). 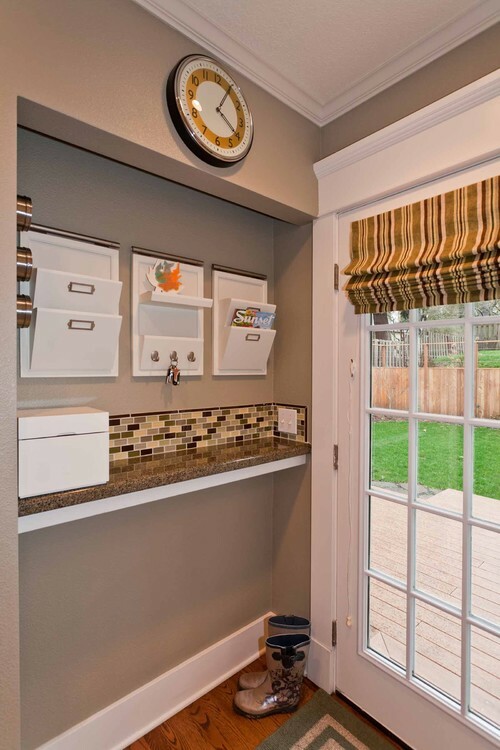 One of the most common problems that people complain about is the lack of space to incorporate additional storage. 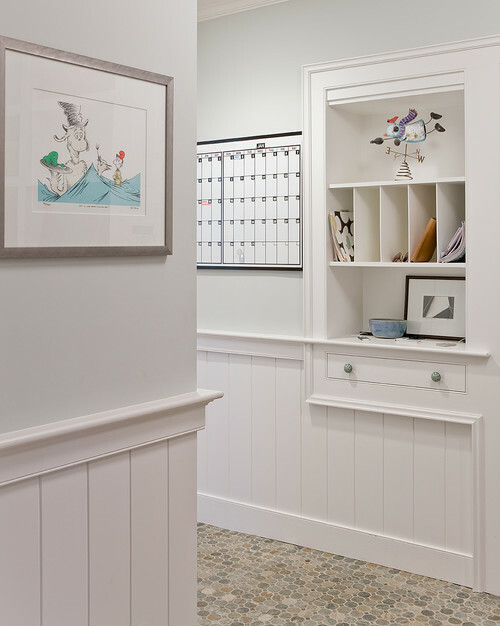 So, when space is an issue, I always suggest to think “in” instead of “out.” If you just do not have room for a piece of furniture to be jutting out into your already narrow space, consider recessed built ins. That space between the studs in your wall is prime real estate. There is no reason why you shouldn’t utilize it for some much needed storage or organizational space. This drop zone (above) was placed strategically to catch things as people enter through the door. Here is another nicely done recessed area. Just a standard 4″ wall allowed for this drop zone to be created. They tied the design into the rest of the home by matching the wood to the other built ins throughout the house. Kitchens can be a nice place to create a key/mail center. 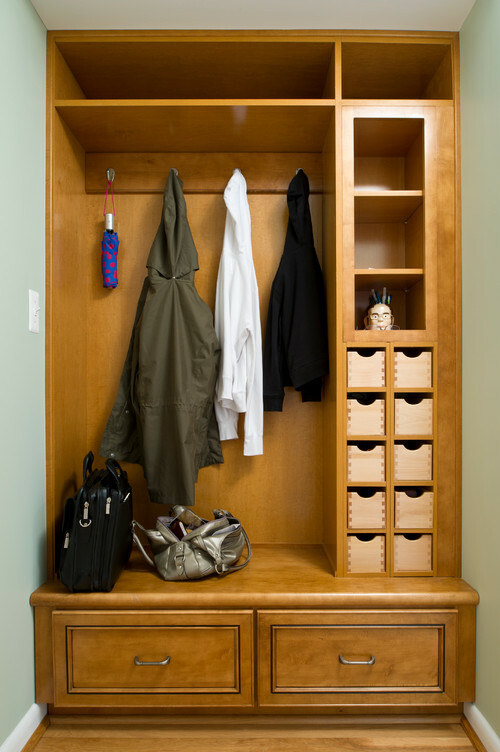 Many have a small unused wall space, where the cabinets ended to leave room for a light switch. 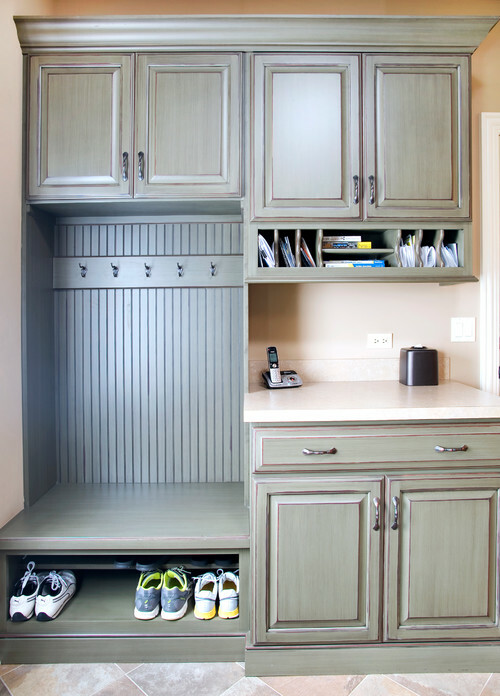 But, if you turn a small custom cabinet on its side, that space can be put to good use. Do you have a home that has one of those bumped in spaces that you aren’t sure what to do with. You know, one of those spaces that seems like the builder had intended to put something there, but then changed his mind. Well, why not use it for a drop zone. This bumped in space above looks like a mud bench or a closet was intended to be here, but they later discovered that the space was just too narrow. However, it makes the perfect mail center. The same concept was used here, as well. And with the lower hooks and easy clean flooring, this drop zone should be able to handle everything, including shoes down below.